Devon ,famous for its Dartmoor and coastline, boasts an unspoilt countryside full of hidden valleys,tranquil streams and quiet lanes. For those wanting to escape the crowds and enjoy the charms of Devon's idyllic countryside, we have carefully selected these top (dog) walks away from the coast and Dartmoor , perfect for late spring & summer. All walks have easy car access and some ,during wet spells ,require firm footwear. 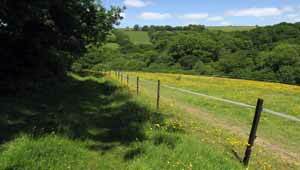 Some public footpaths cross fields with grazing cows or sheep. Why not indulge in a real Devon Cream Tea?